Would the possibility of earning a beach towel or fleece persuade you to get your friends to sign up for your favorite local news newsletter? WhereByUs, a publisher of local news sites around the U.S. certainly thinks it might. Earlier this year, WhereByUs launched an email referral program at three of its brands — The New Tropic in Miami, The Evergrey in Seattle, and Bridgeliner in Portland. The goal is to try and grow its email newsletter lists and reward its most loyal readers. This week in Solution Set we’re taking a look at WhereByUs’ ambassador program, examining its challenges and opportunities, and highlight some of the lessons it has learned thus far. Solution Set is a weekly report from The Lenfest Institute for Journalism and the Solutions Journalism Network. Every Thursday, we take an in-depth look at one groovy thing in journalism, share lessons and point you toward other useful resources you can learn from. I first heard about the ambassador program from The New Tropic’s Ariel Zirulnick, who spoke about it at the Lenfest Institute’s recent Lenfest Seminar unconference focused on newsletters. 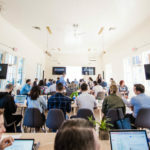 I think it’s a fascinating look at the challenges of building an engaged audience, and I’m glad Ariel and the rest of the WhereByUs team were willing to share their learnings with the wider community. • The Challenge: Local news publisher WhereByUs wanted to create a system to encourage readers to spread the word about its newsletter. • The Strategy: In January, the company launched its ambassador program, which rewards readers who get their friends to sign up for the newsletter. • The Numbers: The Evergrey received about 300 new subscribers through the program and Bridgeliner grew its list by about 10 percent. • The Lessons: Launching a referral program can be a challenge when you have an existing engaged subscriber base, and changing user practices to use the tool can take time as well. • The Future: WhereByUs built its own referral tool, and it could possibly white-label the platform. • Want to know more? Scroll down for more about referral programs from publishers including the Skimm and others. Since it launched its first site in 2015, local publisher WhereByUs’ primary editorial product has been a daily email newsletter. Beginning with its initial site in Miami, The New Tropic, and continuing with its second site, The Evergrey in Seattle, which launched in 2016, the company has relied on word of mouth and organic sharing for much of its growth. Subscribers often just forward the emails to their friends or send them to the site’s homepages where there are prominent sign-up forms. But as WhereByUs began expanding into new cities — it launched sites in Portland, Ore. and Orlando earlier this year — it wanted to find a better way to incentivize people to share the newsletter. It also wanted a more nuanced way of tracking sign-ups. WhereByUs debuted its ambassador program in January in Miami and Seattle. The Portland newsletter, Bridgeliner, launched on the ambassador program this spring, and it really began promoting the initiative in earnest earlier this month. Here’s how the program works: Every newsletter subscriber has a unique URL that leads to a sign-up form. The subscribers can share or post their URL and whenever someone signs up using the form, the initial subscriber will get credit for that conversion. There are three rewards levels, and the more people you sign up, the more swag you get. The levels are the same for each city, but the branding and some of the actual rewards are unique to each market. The first two reward levels are the same in each city (though they’re uniquely branded): If 10 people subscribe to the newsletter using your link, you receive a pack of five stickers; when you convert 25 people you get a branded keychain. If someone reaches 50 sign-ups, they get their swag hand-delivered by WhereByUs staffers along with complimentary beverages. At that point, New Tropic readers get a beach towel, while Bridgeliner readers receive a fleece and Evergrey readers get a blanket. In Miami, The New Tropic said it would deliver the beach towel with a Colada, a Cuban coffee drink, and when it first announced the rewards, readers were way into it. “We got a lot of excitement about that last item in particular because there’s that element of us arriving in person with it and it’s very Miami and very much of the city,” Zirulnick said. And because WhereByUs built a bespoke tool to run the ambassador program, it has a detailed dashboard on the backend to track the signups and follow users’ progress. For now, it’s using the tool only internally, but Zirulnick said it has the option of making the leaderboard public so readers can follow their progress. The company also relied on users to help test out the tool. In Seattle, one of the Evergrey’s most loyal readers helped by pointing out bugs. Zirulnick, Guzman, and Bridgeliner editor Ben DeJarnette all told me that the program announcement was met with a wave of excitement as many readers were excited to be able to share their love of the sites. In Miami, “a handful” of people have hit the 10 referral levels, Zirulnick said. Nobody has hit the New Tropic’s 50-referral level yet. The New Tropic has about 24,000 newsletter subscribers. The Evergrey has had one person hit the 50 referral level. She reached that level by posting her link to her company’s internal message board. “She blew right past it,” Guzman said. “A few” people have hit 25 and “dozens” have reached the 10 referral level, Guzman said. Shortly after it launched the ambassador program, The Evergrey sent an email to its most engaged readers telling them about the new initiative and asking them to share their unique URLs. That callout to its most loyal readers generated about 300 new subscribers, Guzman said. The Evergrey now has about 8,900 newsletter subscribers. Last week, Bridgeliner promoted the ambassador program prominently in every issue of its newsletter. That constant promotion brought a bunch of new sign-ups and grew the site’s email list by 10 percent. One Bridgeliner reader has signed up 46 new subscribers using her unique URL. That’s the most sign ups the site has gotten so far, and she’s the only one to have hit the 25 level also. “A couple” of readers have hit the 10-referral level, DeJarnette said. DeJarnette has also begun giving readers who refer at least three people shout outs in the Bridgeliner newsletter. Moving forward, he plans to share the names of people who have gotten to that level in the newsletter every Friday. By recognizing them publicly, he hopes that will encourage them to continue to share their sign-up form. “My hope is that three will be a sweet spot and we’ll have a couple of people hit that threshold each week,” he said. • Challenging Change: When it launched the program in January, The New Tropic especially saw a lot of interest, but things have slowed down a bit even as the site continues to get new subscribers organically. One of the potential reasons why uptake has been slow is because readers already have a learned behavior for how they share The New Tropic. Readers have been sharing the newsletter the same way for three years already, and it can take some time and explanation for them to get why the new way is better. The site is working to create documentation to share with readers that explicitly walk them through the process and offer tips and tricks for how to share their referral code. Changing reader behavior can take some time, and it’s worthwhile to be patient as readers figure out new workflows that you might be introducing. • Acknowledge your super fans: WhereByUs launched the ambassador program because it wanted to recognize its most loyal readers for helping to spread the word about its sites, but in Miami and Seattle the company already had cadres of loyalists who had already been sharing the newsletters with their friends without rewards. However, it’s looking at ways to honor its early supporters in other ways. 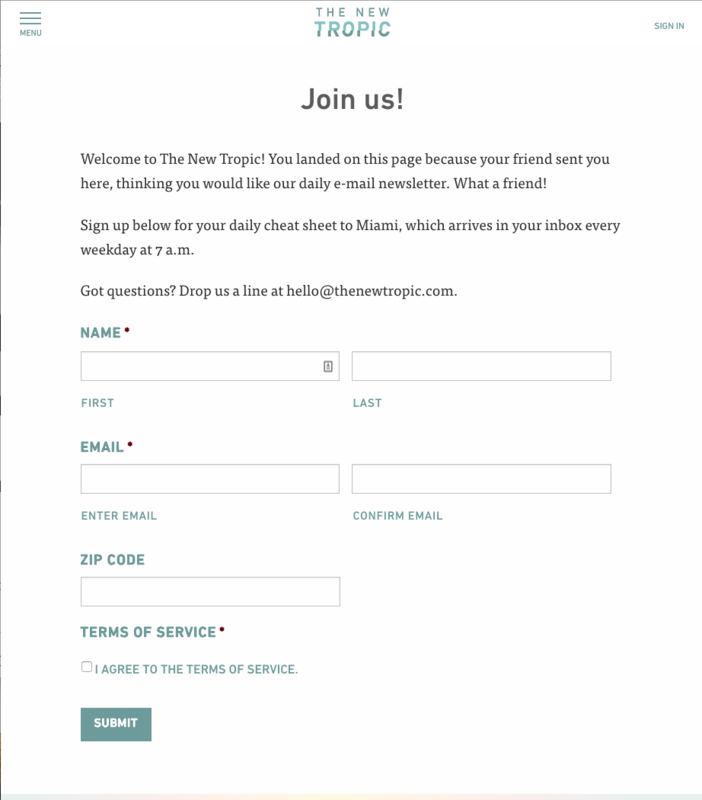 The New Tropic is planning a happy hour this summer to recognize its early and loyal readers. And last fall, to celebrate The Evergrey’s one-year anniversary, Guzman made custom personalized keychains for some of the site’s most ardent fans. She said she hoped that recognition made up for the fact that their initial support wasn’t recognized in the ambassador program. If your newsroom is thinking about launching a similar type of referral program, you’d be wise to figure out how to recognize your existing super fans who are already supporting you. • Test cheaply: Before deciding to build its own referral platform, WhereByUs used the off-the-shelf Typeform platform. The company used Typeform for giveaways, contests, and other things. Typeform didn’t have all the features that the company ultimately wanted, but it allowed WhereByUs to see how readers responded to that type of program and allowed them to tweak things in response to how people actually used it. No matter what type of initiative you might be launching, it helps to test things out quickly and cheaply so you can gauge your audience’s response before investing a lot of time and resources to developing something. • Don’t be shy! : Though it’s seemingly becoming less common in this social media age, journalists sometimes are reluctant to publicize their own work. With the launch of the ambassador program, WhereByUs had to put itself out there and ask its readers for a favor. Publications need to be more “shameless about promoting their products,” DeJarnette said. Still, it can be a balance. WhereByUs is trying to figure out how much it can ask of readers before annoying them or having them tune out altogether. “We’re still trying to learn who do you reach out to? How much is too much asking people for this kind of help? What kinds of rewards do people actually care about? That’s another thing I’m sort of curious about: How much of a motivator are these prizes anyway? I don’t know. We’ll have to do a survey when we have enough data,” Guzman said. In the immediate future, WhereByUs is figuring out how to best grow the ambassador program and increase awareness among its readers. At The New Tropic especially it’s looking to take lessons from what’s working in Seattle or Portland and apply them to its own market. They’re also starting to see people post their referral links in more public places. For instance, at least one reader who was mentioned in the newsletter shared their referral code as the link in their bio on Instagram. A more long-term goal, however, may be creating a white-label version of the referral platform that runs the ambassador program. Zirulnick said a number of people have reached out to WhereByUs about the possibility. “We haven’t explored it quite yet, but that signals to me, at least as someone not in the product space that much, that there must not be something like this out there in a way that’s open sourced,” Zirulnick said. • Here’s a Nieman Lab profile of WhereByUs from earlier this year that goes into detail about the company’s recent expansion plans. • Want to know more about the Skimbassador program? Here’s a Q&A with the site’s founders. •WhereByUs also cited The Hustle as an inspiration for its ambassador program. Here’s a case study of their program from the Autopilot blog. How’s your news org driving new subscriptions? I want to hear about it. Send me an email, I’m at [email protected]estinstitute.org. Creative Commons photo by Frank Jakobi.